The federal Fair Debt Collection Practices Act (FDCPA) does not allow debts that occur mainly due to business purposes and neither does the California Fair Debt Collection Practices Act. 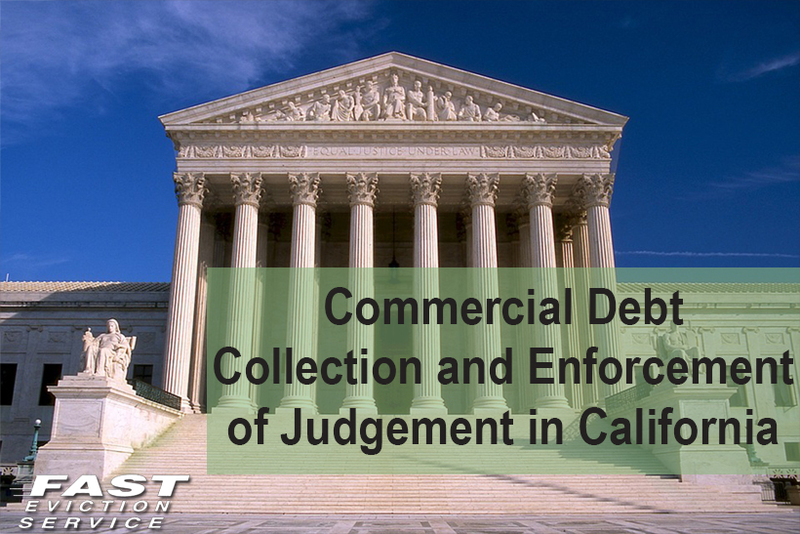 We have listed the complete detail on commercial debt collection as well as the enforcement of Judgment in California below. In case the creditor already has a state court verdict from any other state than California, it needs to get a sister state judgment from any California court. Getting a sister judgment can be started by registering an application for entry of judgment with a California court. This application has to be registered from any county that has a primary office of the business. But it can also be registered from any county even if the business is from another place. Later, the application will be united with a properly authenticated photocopy of the original judgment issued. As soon as the application is registered in California, the court worker has to list it for judgment. The applicant can petition the court to grant a writ of execution or some other enforcement, if there is a possibility of an incorrigible injury. An example of such an injury includes hiding or transferring of assets from the debtor, the possibility of leaving California and if it is on the threshold of insolvency. In almost all the cases, the notice for the entry of judgment has to be provided on the debtor in the same way as complaints or summons. The creditor has to wait for at least 30 days before any enforcement proceedings start until and unless the creditor has a writ or some other ways of enforcement which depend on a serious injury. The enforcement proceedings include registering a judgment lien on the personal property, acquiring the issuance of a writ of execution, and getting and maintaining an abstract of judgment related to real estate. The most important solution for administrating a judgment is a writ of execution. There is no advance notice of this execution that is sent to the debtor. So, until and unless his income or assets are seized, he will not know about the writ of execution. In order for a levy to be made, a separate writ of execution has to be issued for each county. Therefore, it is best to get a writ for every county where the debtor has assets or business when the entry of judgment is made. All writs can be renewed immediately and they stay valid for 180 days. A single writ of execution can also enable multiple levies. These levies can be circulated against personal property, bank accounts and accounts receivable. But the intangible properties, such as notes, accounts, etc. should be considered first before issuing a writ of execution because they are a lot costlier. For debtors having a growing business already, issuing a levy may be costly but highly effective if done on inventory or through installing a keeper. The debtor has the power to announce bankruptcy. All form of entities, such as LLC’s or firms can register for a chapter 7 bankruptcy that includes liquidation or a chapter 11 bankruptcy that includes restructuring with the resolute to keep the business going. On the other hand, individuals that incorporate sole proprietorship can only file for chapter 7 bankruptcy, also known as the wage earner’s plan. The most important thing to be completed in a bankruptcy is filing a request for the special notices; i.e., the assurance of receiving notice for every hearing. Along with these, a bankruptcy also includes filing a claim for a debtor who has the total of the debt and the kind of debt indexed in the schedules. The biggest benefit in bankruptcy is enjoyed by a secured creditor. There are three forms of claims in a bankruptcy that incorporate priority claims, secured claims and the unsecured claims. Priority claims incorporate the costs of all the bankruptcy dealings and many taxes. In the secured claims, the creditor has the legal authority to get paid from the security in the case when there are sufficient assets to pay off the claims. The last category is the unsecured claims that are not protected by any assets.